Purchased by Jeremiah James Colman in 1869 as a second residence for his family. The house was enlarged in 1874 and Jeremiah and his son, Russell purchased more land in Corton, Blundeston, Flixton, Gunton, Hopton and Lound, most of which was bought from the Fowler family of Gunton Hall. Jeremiah was also responsible for building the Methodist Chapel (1874), the Village Hall with the Bowling Green (1881), Anchor Cafe in The Street (now turned into houses), Almshouses and cottages for the people who worked on his estate. He also funded the building of the school. Jeremiah spent £70,000 on a sea wall in the 1870s to try to prevent coastal erosion but this started to crumble in 1903 and by 1917 'The Clyffe' was in such a dangerous position that the contents of the house had to be sold and the house was partially demolished. Finally, after the First World War, the estate and many of the houses were sold to East Suffolk County Council, to be divided into small holdings and farms for tenants who wanted to return to making their living from the land. The Colmans are famous for their mustard which is produced in Norwich - to find out more about the Colman Story please click on the link - http://www.colmans.co.uk/colmans-story. Mr King, headteacher of Corton School between 1984 - 1988, submitted information about Corton Village and much of the research was carried out by 9 - 10 year olds living in Corton in 1986 (unfortunately this has just been removed from the BBC website). The Bungalow Stores (as it was known) was built in 1932. It was kept by Mrs Hilda Weaving as a general store selling cooked meats, vegetables and groceries. In 1945 Mrs Weaving sold the Stores to Mr Sidney Chambers who became the postmaster. The bungalow's front room was made into the post office. It was open from Monday to Saturday from 9 am to 6 pm except Tuesday which was early closing. Mr Chambers died in 1956 and Bill and Joan Simpson took over the Stores and Post Office which they ran until Mr Simpson's death in 1977. Mrs Simpson then sold the Stores to Mr Mike Watson who ran it until 1980 when it was taken over by David and Heather Habbin.When the Post Office closed in 2003 it was the end of an era. In 1814, a Roman Signal Station was discovered at Corton in an area which has now been lost to the sea. The Signal Station inspired the design for the Village Sign which was erected in 1977 and now stands outside the Village Hall in The Street. The Hut was built in 1924 with the first licensee being Mrs George. By 1929 the hotel was owned by Charles Stokes followed by Mrs R Cribbens in the 1930s. During and after the war the proprietors were Mr and Mrs Victor Jones who also owned the land behind it to the cliff edge. Warners brought The Hut from Mr and Mrs Jones in 1956 and installed managers, Mr and Mrs Wilcox. They had previously kept the Great Eastern Hotel in Lowestoft and Mr Wilcox was a former professional footballer. Mr Williams was the next manager after the Jones' and he also managed the holiday camp. In 1984 the house which stood next to the Hut (The Manse) was demolished followed by the garage being demolished four years later. There has been considerable changes to the Hut since 1990. A large function room has been added and the interior has been altered several times with new bars, restaurants and satellite television. August 2018 - At the moment, The Hut is closed. The Mill was built in 1837 and continued to work until 1906/07. It was sold by the Colman Estate in 1921 for £450, the machinery was removed and finally dismantled in 1922. Since that time it has been completely renovated and is still one of Corton's prominent landmarks. The site was awarded to the Surveyor of Highways in the 1813 Enclosure and the gravel from the pit subsequently dug was used to maintain the local roads. By the end of the 19th Century it had reverted to a sort of public open space known as the Town Pit or Cockles Pit. Jeremiah Colman provided children's swings and roundabouts for the area. By 1911 the village was beginning to use the Pit as a refuse dump and the Parish Council complained about the plaque of rats emanating from it. By the early 1960s the dumping of rubbish had totally spoiled the Pit which was now overgrown and it was infilled with more rubbish topped with soil. The site was allowed to settle and levelled off in 1984. The area was then grassed and turned into a children's play area. The original White Horse was situated in the old main street, north of Baker's Score. Between the years of 1844 and 1862 the old building was abandoned and the new inn built at its present site. Previous landlords were in the 1890s to 1920s Mrs Elizabeth Smith, 1920s to 1930s, Mr Fred Pye, 1940s, Mr William Dunn, Mr Donald Sandford, then in the 1950s, Mr and Mrs Reece, followed by Mr and Mrs Bullent in the 60s. Other landlords include Mr and Mrs Hilland, Mr and Mrs Ogston, Mr and Mrs Worrall, Mr Brighty and Mr Cooper. The Village Hall was built in 1890 by the Colman family when the reading room at the Anchor Cafe could no longer accommodate all the many lectures, evening classes, teas suppers and entertainments. The Village Room was let to the village at a nominal rent until 1934 when Alan Colman handed it, along with the Bowling Green, to the Parish Council who agreed to act as Trustees. In 2011, the Village Hall became part of the school. 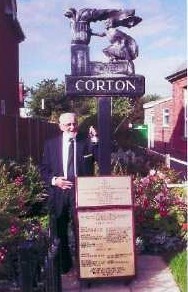 A plaque commemorating Corton men who died during World War 1 and World War II was fixed to the village sign and unveiled in a special ceremony on 9th September 2001. This was the idea of Mr Harry Blowers who organised most of the arrangements including fund raising. 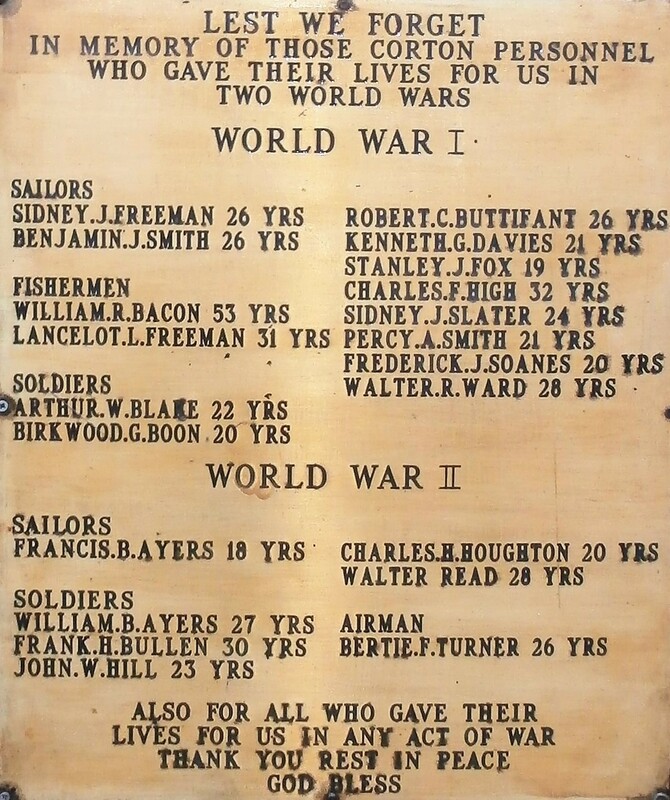 The Roll of Honour website also shows details of the men listed on the memorial. 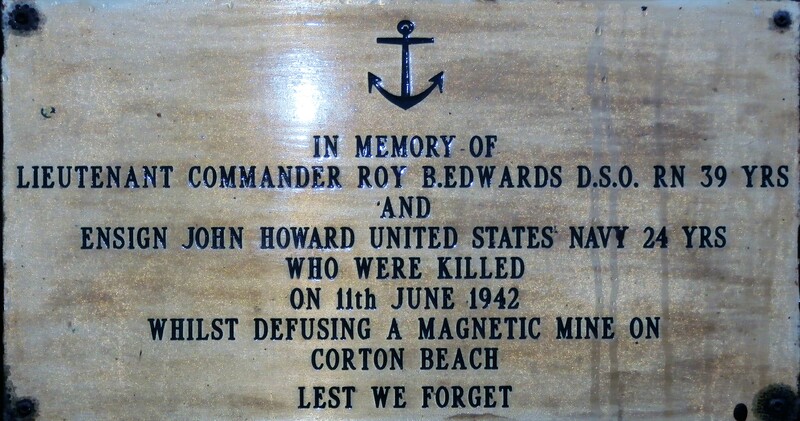 A second plaque was installed on 9th June 2002 commemorating Lt Cdr Roy Edwards DSO RN and Ensign John Howard USNR who were killed whilst defusing a booby trapped mine on Corton beach in 1942.